Against the general appeal of dry, vintage-dated wine, most champagne (the “authentic” stuff from a demarcated area in France) sold in the United States and elsewhere is non-vintage “brut” (slightly sweet bubbly wine). In fact, only about 10% of the production of champagne is vintage-dated. A large part of the reason for this trend is that because of climatic conditions in the Champagne region (about an hour drive northeast of Paris), only about half of the years in any decade will the weather permit for adequate ripening of grapes to make even “just decent” wine. And while everyone nowadays says they like dry wine, most prefer a bit of sweetness in what they are drinking, especially in the United States. Another reason is that consumers expect that a particular producer’s product will be about the same from year to year, which usually requires blending of wine from a number of different harvests to maintain the anticipated consistency. 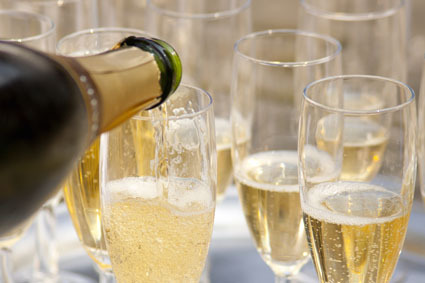 Like most other champagne, these wines are produced from a combination of Pinot Noir, Pinot Meunier and Chardonnay grapes made by the méthode champenoise, in which after the original wine is bottled a second fermentation to produce the bubbles takes place in that same bottle by the addition of a small amount of sugar and yeast. Also importantly, the wine must age during the second fermentation for at least 15 months to make sure the process is complete. At the conclusion of the process, a small amount of sugar water (dosage) is usually added when the dead yeast is removed before bottling. These champagnes are generally lower priced than the “vintage” bottlings (made from the harvest of only one particular year), which add to their popularity. But there are so many of these wines with varying styles on the market that consumers often face a quandary in choosing one or two that fit their taste. A sampling of over two dozen brut champagnes was conducted by the Wine Media Guild (a New York-based group of professional wine educators and communicators). All wines were first tasted without food and then during a specially prepared luncheon in Manhattan. In tasting these wines alone and then with food I found that they could be divided into three groups. – Those sparklers that were light and elegant and would mate best with fare like shrimp, caviar, oysters, or delicate fish such as dover sole or cod. – Those bubblies that were rich and fruity and could stand up to the likes of smoked salmon, baked chicken, grilled veal chops or even pasta with pesto. – And a group of champagnes that were somewhere in between the other two categories, showing a bouquet and taste that was pleasantly mellow and perfect for toasting without fare or for drinking following dessert. The champagnes are listed alphabetically within each group. Notes follow, with prices listed reflecting typical retail cost for a 750 ml bottle, not including tax. A.R. Lenoble Blanc de Blancs Grand Cru NV – $52. This 100% Chardonnay wine from a small, family-owned independent producer shows a floral bouquet of dried apricots and hints of mint, with a memorable toasty taste and vibrant finish. Bollinger Special Cuvée Brut NV – $68. A bouquet and taste of pears and brioche with a vibrant acidity dominate in this blend of 60% Pinot Noir, 25% Chardonnay, and 15% Pinot Meunier. Deutz Brut Classic Champagne NV – $45. Fashioned from equal amounts of Chardonnay, Pinot Noir and Pinot Meunier grapes, this wine shows a refined bouquet and taste of French toast with an undertone of light honey and a long smooth finish. Laurent-Perrier Ultra Brut Zero Dosage NV – $60. Albeit a bit too austere for my palate, this wine made from 55% Chardonnay without any dosage added, has a bouquet and taste of apples and spice, and will appeal to those who like very dry champagne. Moët & Chandon Brut Imperial NV – $38. This delicately seductive bargain wine shows a bouquet and taste of ripe apples, peaches and brioche that intensifies as it sits in the glass. The vibrant finish is memorable. Perrier-Jouët Grand Brut NV – $37. Made from 40% Pinot Meunier, 35% Pinot Noir and 25% Chardonnay, this wine was a bit light and too one dimensional for my taste, with primarily lemony notes and a rather short finish. Ruinart Blanc de Blancs NV – $68. This 100% Chardonnay bubbly shows a memorable bouquet and taste of just-baked brioche, with hints of grapefruit and a crisp, lemony finish. Ayala Brut Majeur NV – $35. Made from a blend of 40% Chardonnay, 40% Pinot Noir and 20% Pinot Meunier, this wine has a bouquet and taste of just picked apples and lemon, with a hint of lime in the finish. Billecart-Salmon Brut Reserve NV – $50. A personal favorite for its quality compared to price, this wine is comprised of 40% Pinot Meunier, 30% Pinot Noir and 30% Chardonnay from over 20 different vineyards. It shows a bouquet and taste of peaches and pears with notes of honey and a crisp finish. G.H. Mumm Cordon Rouge Brut NV – $38. From a blend of Chardonnay, Pinot Noir and Pinot Meunier, this wine shows a bouquet and taste of dried apricots with hints of vanilla and a crisp finish. Henroit Blanc de Blancs NV – $59. Unlike a number of too-light bubblies made from 100% Chardonnay, this wine shows a fragrant bouquet of honeysuckle and almonds and a lusty taste of dried fruit and exotic spice. JP Lamiable Brut Grand Cru NV – $58. Predominantly Pinot Noir and about 20% Chardonnay this wine shows a bouquet and taste of peaches and dried fruit, with hints of honey and lime in its vibrant finish. Blanc de Blancs NV – $55. Against the trend of blending, this bubbly is made from 100% Chardonnay grapes and aged for three years on the lees (dead yeast). It shows a yeasty bouquet and taste of apples and notes of pears with a long, full finish. Pol Roger Brut White Label NV – $45. Composed of almost equal parts of Pinot Noir, Pinot Meunier and Chardonnay, this wine is allowed to rest at a low temperature for almost three years before release. Delightfully complex, it shows a bouquet and taste of walnuts and poached pear with a vibrant, lemony finish. Taittinger Brut La Francaise NV – $43. Fashioned from 60% Pinot Noir and 40% Chardonnay, this wine has a fragrant bouquet of ripe pears and honey with a memorably smoky taste and a touch of vibrant acidity in its finish. Veuve Clicquot Yellow Label Brut NV – $45. This wine is made of 55% Pinot Noir, 20% Pinot Meunier and 25% Chardonnay. The bouquet and taste shows layer upon layer fresh green apples, brioche and lemon meringue with a refreshing finish. André Jacquart Brut Expérience Premier Cru NV – $46. This Chardonnay-based wine, produced by a combination of barrel and stainless-steel fermentation compares well to champagne sold for 2-3 times its price. It shows a toasty bouquet and taste with lingering flavors of ripe pears and dried apricots and a long, refreshing finish. Bruno Paillard Brut Premiere Cuvée NV – $45. Fashioned from a blend of primarily first press Chardonnay grapes with smaller amounts of Pinot Noir and Pinot Meunier, this bubbly shows a bouquet and lush taste of apples and ripe peaches, with a refreshingly vibrant acidity in its finish. Charles Heidsieck Brut Reserve NV – $58. This blend of 34% Pinot Noir, 33% Pinot Meunier and 33% Chardonnay is very fruity with a bouquet and taste of ripe nectarines, with hints of pears and a touch of spice in its graceful finish. Duval-Leroy Premier Cru Brut NV – $59. Made from primarily Chardonnay (70%) with the remainder Pinot Noir (30%), this sparkler shows a bouquet and taste of ripe pears with hints of brioche and brown sugar in its finish. Gosset Grande Reserve Brut NV – $65. Fashioned from 43% Chardonnay, 45% Pinot Noir and 15% Pinot Meunier, this is a big fruity wine showing a bouquet and taste of ripe baked fruit and toasty undertones, with just enough acidity to balance the flavors. Lanson Black Label Brut NV – $39. Produced from a blend of 50% Pinot Noir. 35% Chardonnay and 15% Pinot Meunier, this wine shows a bouquet and taste of pears and toasted raisin bread, with a smoky finish, balanced by a touch of citron. Premier Cru Brut NV – $50. Made from a blend of Pinot Noir and Pinot Meunier (60%) and Chardonnay (40%), a fragrance and taste of honey dominates this wine with hints of lemons and lime in its finish. Louis Roederer Brut Premier NV – $40. This very popular sparkler, made from 40% Pinot Noir, 40% Chardonnay and 20% Pinot Meunier has a fragrant bouquet of ripe apples and toasty brioche and a smooth complex taste of fruit, oak and spice, with a hint of grapefruit in the finish. Pascal Doquet Les Mesnil Blanc de Blancs NV – $54. This 100% Chardonnay from an organically maintained vineyard shows a bouquet of dried apricots and peaches with a mouthfilling taste of ripe fruit and hints of brown sugar and spice, with a touch of lime in its refreshing finish. Piper-Heidsieck Brut NV – $36. Made primarily from Pinot Noir grapes, this sparkler has a fragrant bouquet and taste of pears and citrus with hints of ginger in its vibrant finish.